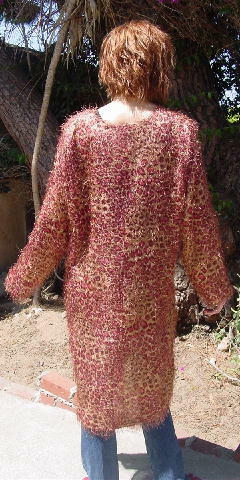 This 100% polyester lightweight vintage long jacket was made in the USA by F.A.D. 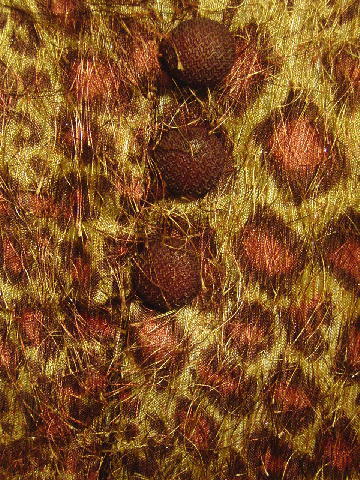 It has a shiny animal print pattern in pale gold, light copper, and medium brown. The exterior surface has long threads in the base colors with some clear shiny threads. It's unlined and has long sleeves and a 10" long V neckline. 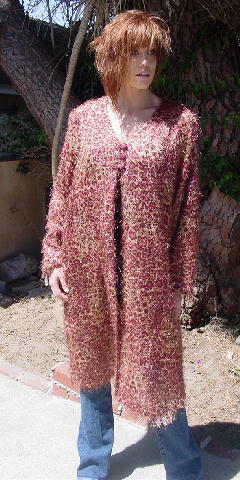 At the base of the V neckline are three textured brown buttons and three fabric brown loops. shoulder to end of sleeve 23 3/4"
shoulder to hem 42 1/2"